This very soft plaid is of exceptional quality, very warm. It is an essential for winter season. You can wrap yourself with it or put on your sofa. This plaid is an essential for winter. It is beautiful, very soft and so comfortable ! It can be worn over your shoulders or you can put on you sofa to decorate your living room for a cosy atmosphere. 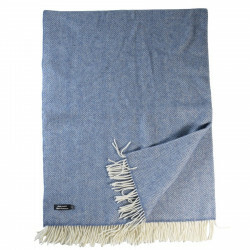 Founded in Ireland in 1893, John Hanly is an Irish business specialized in scarves, throws and woolens manufacturing as well as cashmere, lambswool fabrics and other natural fibers. John Hanly continues to be a family-run business: Brian Hanly is today the fourth CEO of the company, which is located in Ballyartella Wool Mill, in the county of Tipperary, Ireland. In the 1950’s, a fire destroyed the entire manufacturing unit. John Hanly Co. had to start all over: this is how wool spinning and carding stopped, and how the company became focused on the trade of woollen fabrics. A full-time designer was then hired. In the late 1980’s, the range of accessories (scarves and plaid throws) grew as new yarns came into use, broadening the product collection for its customers. 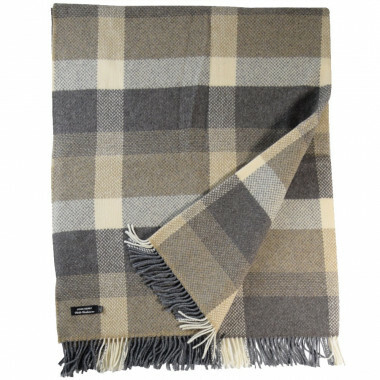 At the beginning of the 1990’s, the demand was so high for John Hanly’s throws and scarves that a new structure is set up: in the company’s warehouses, throws and plaids are put on shelves, awaiting orders from customers and shops around the world. As the collection of accessories grew, the production of woollen fabrics and accessories are now even. Today, John Hanly’s products are sold to designer brands and stores worldwide. The company is deep rooted in Irish tradition, and continues to offer outstanding, timeless styles and products of the finest quality.